I spend a long weekend in the West Palm Beach area with two friends, as part of an effort to complete our adventure plans to Belize, and to explore outdoor South Florida. On our first day, we kayak 8 miles on the Loxahatchee River, which is the only river in Florida designated by the federal government as a Wild and Scenic River. Many of the rivers in south Florida have been channelized or otherwise abused by the rampant suburban sprawl in that part of the state, but we find the Loxahatchee to be a very attractive, cypress-filled, narrow-channeled stream free of development along its banks. The surprisingly tight and narrow river for the first half of the run is rather technical. In two locations, there are small, log-formed dams (see photo). At the second dam, one of my paddle buddies joins me in portaging over the wooden ramp. The third buddy scoffs and says, "I'll see you ladies on the other side." But that is before he reaches the edge of the falls and notices that the drop is significant. He reluctantly decides to join the "ladies" on the ramp. At the bottom of the ramp, the buddy who first joined me has slid his kayak down to the end of the ramp on the other side, but it slides too far and he loses his grip, which forces me to paddle downstream about 200 yards to retrieve it. 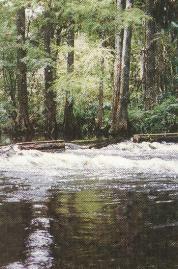 The first half of the river passes through a pretty cypress forest canopy. Approximately a third of the way downstream, we notice the load roar of freeway car traffic, and we soon pass under the enormous I-95 and Turnpike highway bridges, which seem like a domed sports stadium underneath. Soon afterwards, however, we return to the experience of a quiet paddle. Just after "Trapper Nelson's" camp, we reach the downstream section, which is a wide, mangrove-filled section of the river. Oddly, while the take-out point at a public boat dock in Jonathan Dickinson State Park is only about 5 miles from the put-in point, the finger-like geology of the area—and the sprawl-induced traffic congestion—requires a drive of about 35 minutes to shuttle vehicles from put-in to take-out. On the second day, we travel south to Markham Park in Broward County. The 665-acre park is at the edge of the Everglades Conservation Area and features a network of mountain bike trails—including Beginner, Intermediate, and Black Diamond Expert trails. We opt not to waste time on Beginner trails. I would rate the Intermediate trails there at the same level as Santos red trails. The trails are very technical: Big and sharp rocks, very narrow and steep uphill and downhill single-track, banked turns, lots of "slalom" through tight, dense melaluca forest, and neat little ups and downs. Very firm surface. Compared to Santos, hardly sandy at all. A sign that it is serious biking: Nearly everyone we see there has VERY expensive dual suspension bikes. On 6 or 7 of the downhill sections, the downhill is so steep that I am certain that I would have an ugly, summersaulting crash or tumble. But I do every one without incident, mostly by gripping very hard on my rear brake. Incredibly delightful. A serious cardio work-out, and lots of scary thrills. The park is just off of I-595 on SR 84. We conclude our ride that day with a pedal on the 6-mile long "Conspicuous Consumption" Trail, so named because of the extremely wealthy homes that front the length of the trail in Palm Beach (known by non-wise guys as the "Lake Trail"). Many times, we are close enough to peer into the front windows of the homes, most of which are screened with a thick hedge. The trail is a paved, 8.5-foot wide surface, and seems very romantic and sociable.